The ducts in our home are not something we think about often. Why would we? It’s not like we see them, or really know what goes on within them from day to day. But if we could, I think we would start paying a little bit more attention. Our duct systems are essentially filters for the air we breathe. Air duct cleaning is necessary to make sure our air supply is not pregnant with air pollutants and contaminants. If they are not properly maintained they can quickly become polluted with debris, dust, pollen, and sometimes mold. This can lead to allergic reactions and illness. 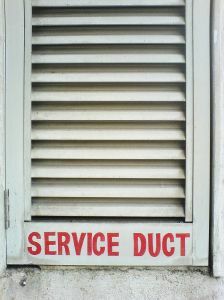 Regularly cleaning your ducts is important but there are some cases where a complete duct replacement is necessary. One of the factors you may want to consider is how old your home is. Heating and cooling systems that are out of date can be quite troublesome. HVAC and duct cleaning systems today are typically designed around energy efficiency. If someone in your family suffers from allergies, upgrading your air system may be in your best interest—for both money and health reasons. If you see no signs of contamination or build up from a visual inspection of your ducts, you are probably fine. But the only way to truly know is to hire a professional company that specializes in duct work. Another tell-tale sign you may need a replacement is if a previously used company installed the system incorrectly. Again, you won’t know without having a professional looked at it, but an indicator of poorly installed system is inadequate heating/cooling throughout your home. To learn more about duct replacement and cleaning in Tampa, call Millian- Aire Enterprise Corp. today 888-628-0691. Pollution, pollution everywhere; pollution, pollution in my indoor… air? Do you have any idea the kind of stuff that you’re inhaling in a Tampa building where no air filtration systems are installed? The insides of buildings are gross. You might be inclined to disagree, arguing that you’re indoors, where there is less visible grime and dirt and grossness, but you’d be wrong. Outdoor air pollutants have been linked to all kinds of health problems, but on average Americans spend 90 percent of their time inside, so basically it should be obvious that the quality of what we breath is kind of a big deal. Well it isn’t. Obvious, that is. Studies have shown that the empty space indoors is likely to be 2 to 5 times as polluted as what’s outside, and sometimes up to one hundred times as much. And you’re just sitting in it all day chillin’. Without any kind of air filtration systems installed in the Tampa building, all those pollutants just fester, growing more and more concentrated due to poor ventilation. Poor indoor air quality is actually categorized as one of the top 5 environmental risks to public health. But hold on a second, what exactly is meant by “pollutants”? I’m not exactly doing weird science in my bedroom. What could possibly be inside my house that isn’t coming in from the outside? It’s simple osmosis, the worst that the quality can get would be equal with whatever’s outside. Wrong again. But don’t worry, you aren’t expected to know this stuff! This is just for placement purposes.